This Floating Stainless Tea Infuser with drip bowl is easy to use, easy to clean. Just add your loose tea to the mesh infuser, screw on the top and submerge into your cup of perfectly heated water. The infuser will float and when your tea is ready, just lift the infuser and place it in the tidy drip bowl. Brewing couldn’t be easier! 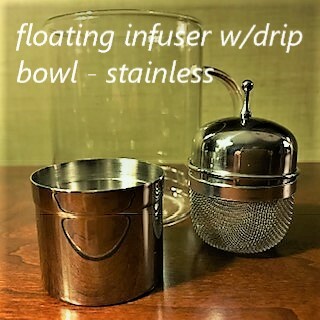 Be the first to review “Floating Stainless Tea Infuser with drip bowl” Click here to cancel reply.